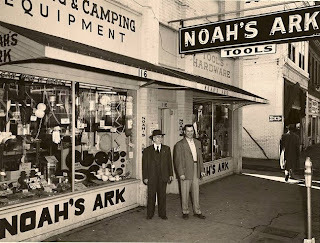 Anyone who lived or worked downtown before Urban Renewal probably knew of Noah’s Ark- a quirky little store that was “docked” at 116 E. Main Street for 34 years, and later at 516 S. Detroit (from 1966-1974). 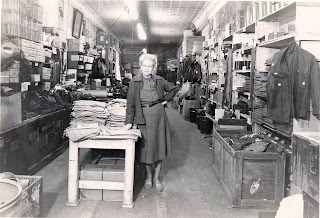 A Depression-born business, it was known as the store “with a million items” – and they weren’t kidding. And that was probably very true. 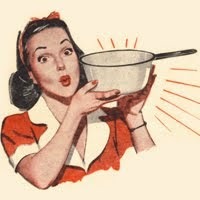 Here is a photo of Sam Burns’ wife inside the store. The DeVille Hotel was next door but after the war, in the early 1940’s, Burns bought the entire building, closed the hotel and expanded. 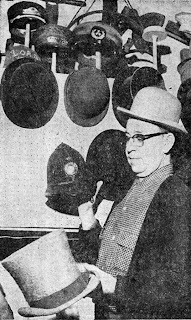 The Elder Burns passed away in 1955. Phil and his wife Jane ran the business themselves. 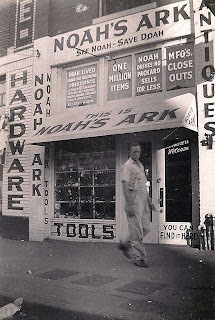 In a newspaper article from 1966, Phil is quoted as saying, “When we opened (Noah’s Ark) here we couldn't even afford to have the lights turned on. We used candles at night, then finally could afford to buy a (gas) lantern.” The store operated “on a shoe string- or actually two shoe strings” but people really were satisfied with a lot less in those days. And the two Burns fellows were sign-crazy, to be sure. Signs were everywhere, inside and out. 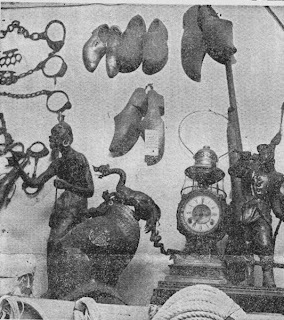 “If you think its junk, just price it.” Another sign hanging over a wallboard full of hats proclaimed, “A lid for every nut” There were antiques, wall clocks, carved figurines, mounted elk heads, swords, old bayonet’s, rifles and….well, you get the picture. One reason for the store’s success was the good humor that marked their sales approach. 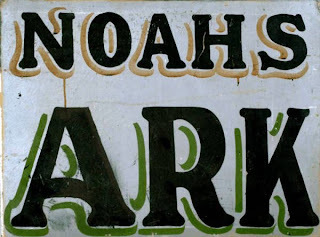 “Noah’s Ark believes in square dealing. If you wish to be cheated, trade in Europe. I have lived a thousand ages, and I know human nature. I buy everything but stocks and bonds. I have never seen the fan dance yet. This hole in the wall is my business. 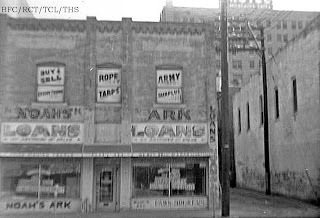 The unique business was forced into moving when the Tulsa Urban Renewal Authority acquired its First Street property. 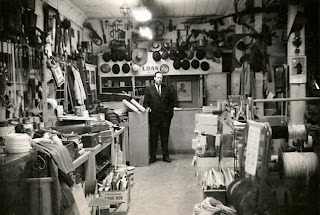 Burns relocated the store to 516 S. Detroit. The name was the same at the new place, but the store had lost that happy jumble known at the first site. Items for sale in the 1970’s were socks, inexpensive cutlery, paper goods and an emphasis on costume jewelry. In 1974 the store closed for good. Next up: Memories of growing up on First Street from Phil’s son. 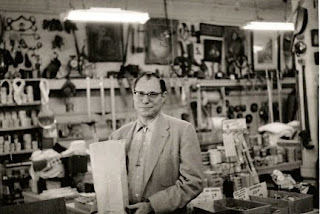 There were some great stores in Tulsa over the years. As a kid, I remember my mother and I going downtown to shop at Kress's department store. They had a counter in the middle of the store that sold warm, salted peanuts. It was just the best. Thanks for sharing. Tuesday I will have a post inspired by your banner. Stop by if you get a chance. This is a very interesting post. 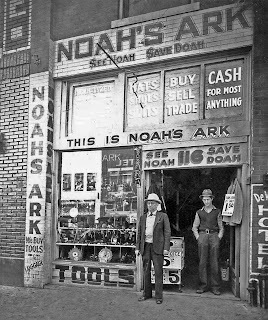 I used to by some clothes at Harrington's (both locations) but don't remember Noah's. Very nice character sketch as well as interesting history. Excuse be for taking do long to comment but I have been busy exploring route 66. This is fun. Very interesting slice of local history! I am very interested in contacting Phil Burns' son. I am his cousin!!! Yes, Sam Burns (Phil's father) was my grandfather's brother!!! Please leave an e-mail address that would help me find him. Please email me at tulsahistory@aol.com and I will try to help you out.